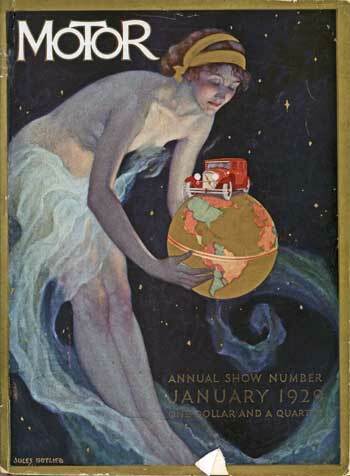 January 1929 cover. A tall, sprightly female figure floats in the night sky, holding a world globe as her nightlight. A sparkling red sedan rests, literally, atop the world. Artist Jules Gotlieb (April 19, 1897 — January 1978) was born in Flushing, Queens, studied at the Art Students League, the National Academy School of Fine Arts, and the Pennsylvania Academy of Fine Arts at Chester Springs. Some of the teachers who influenced his work were George Bridgman (figure studies) and Harvey Dunn (illustration). Gotlieb lectured at the Art Students League from 1932 to 1934. His Art Deco images appeared on MoToR covers from 1929 to 1932 and showed a woman in such large scale that a car was dwarfed in her presence. When comparing female beauty to mechanized movement, there was no contest as to which was more powerful. He also illustrated both cover and interior art for magazines such as Collier's, Redbook, McCall's, The American Magazine, Women's Home Companion, Good Housekeeping, Liberty, Judge, Cosmopolitan, and American Weekly. His book illustrations appeared from at least 1927 to 1974, covering such genres as children's books, text books, detective stories, fairy tales, Bible stories, histories, biographies, and music books. Representative titles included The Adventures of Robin Hood (1927); Young "Ike" (1953); Grimm's Fairy Tales (1968); and A Free People: the Story of the Declaration of Independence and the Men who Wrote It (1969). A member of the Society of Illustrators, Gotlieb was a world traveler who amassed more than two thousand books for his reference library.